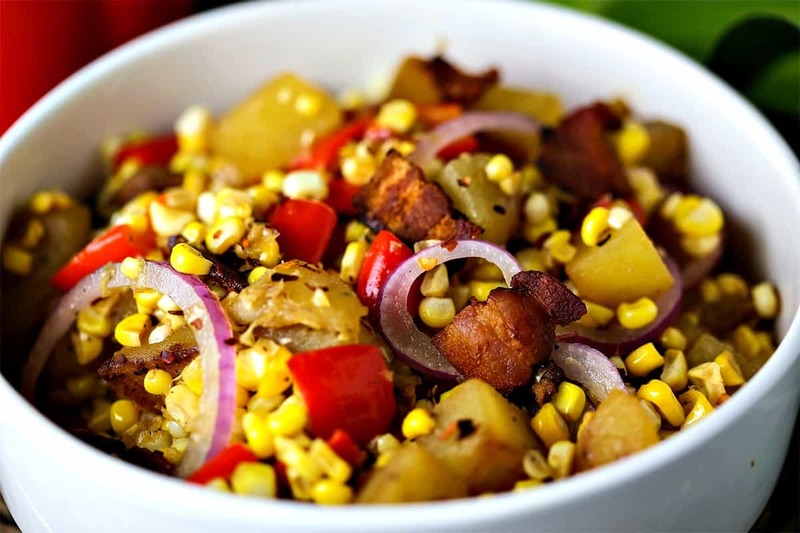 Whip up a Warm Corn Chowder Salad with a quick pan fry of freshly cut corn, creamy Yukon gold potatoes, and diced red bell peppers. Served warm, this tangy vegetable salad is simply dressed with apple cider vinegar and seasoned with salt and pepper. The other secret to this dish’s goodness is BACON. Forget the olive oil when you pan fry these veggies. Diced Yukon Gold potatoes are browned in the same skillet with the rendered bacon fat. Add the fresh cut off corn and diced red bell peppers and continue pan frying until all the veggies are tender. A trip to the Farmer’s Market resulted in some mighty fine eating this past week. 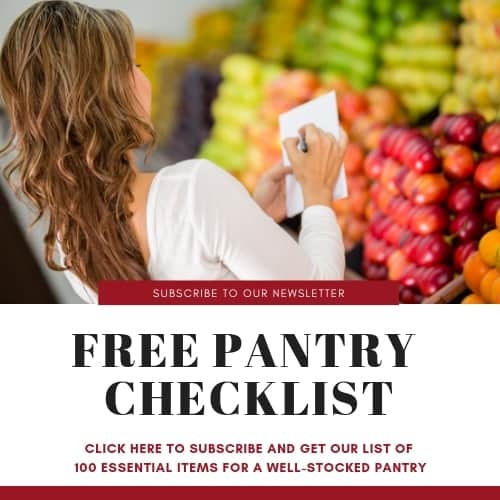 Our fridge was fully stocked with fresh locally-sourced vegetables—sweet corn, Grainger County tomatoes, peppers—and even blueberries and Bing cherries! 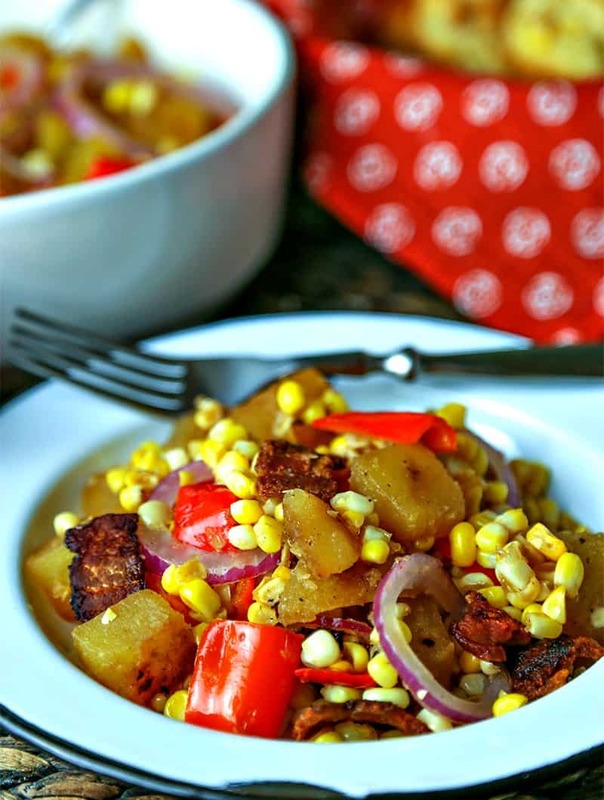 Don’t be jealous, but we’ve done a bit more scratch cooking than usual, including this Warm Corn Chowder Salad which was a great side dish for grilled pork chops! Side note: With the schedule we’ve been keeping, we’ve been lucky to have any food in the house, even for a food blogger! That’s why a dish that’s this fresh has me so excited! Serve Warm Corn Chowder Salad either as a side dish or as the main entrée. All in all, making this dish takes less than 10 minutes. 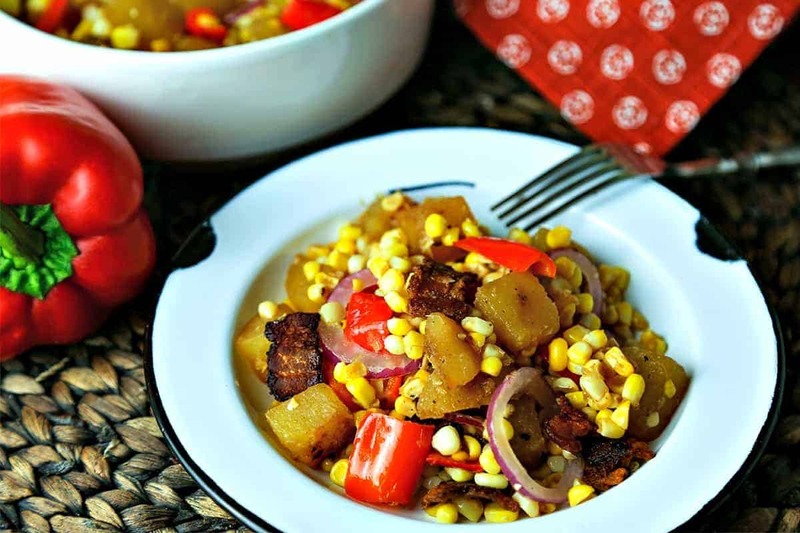 After frying the corn, the final step is to toss the warm vegetables with thinly sliced red onion rings, crispy fried bacon, and a splash or two of apple cider vinegar to add a little tanginess. When fresh corn is available, I also love making Southwest Shrimp and Succotash or simply grilling fresh corn on the cob. I found this salad to be hearty enough on to enjoy on its own or as a side for chops or chicken. Mexican Street Corn Salad — Sure to quickly become one of your favorite go-to sides for taco nights at home! Spicy Grilled Corn — Sweet and spicy, this grilled corn is a real summertime dinner treat. Corn Salsa — The perfect summer accompaniment for taco night or try as a delightful topping for grilled catfish. Parmesan Grilled Corn — One of the easiest and most delicious ways to enjoy fresh corn. Fresh Corn and Avocado Salad — Toss together fresh corn, tomatoes, and red onion with a light homemade vinaigrette. 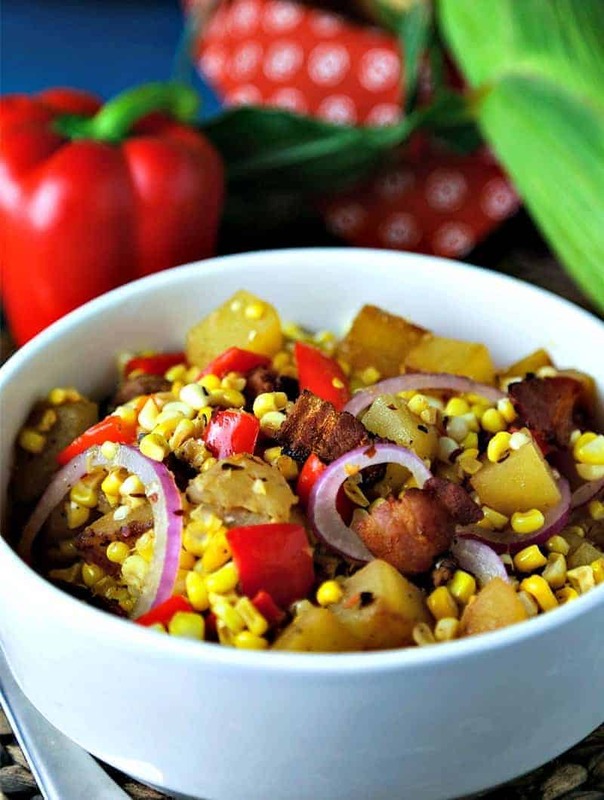 DID YOU MAKE THIS WARM CORN CHOWDER SALAD RECIPE? 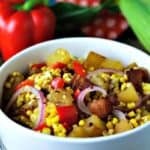 Warm Corn Chowder Salad—a quick pan fry of freshly cut corn, creamy Yukon gold potatoes, and diced red bell peppers is the base for this tangy vegetable salad. Using a large skillet, fry bacon over low-medium heat until it is crisp—about 5 minutes. 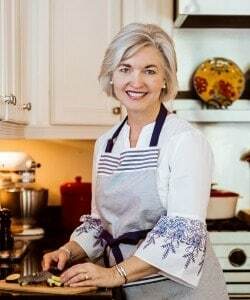 Using a slotted spoon, transfer bacon to a paper-towel lined plate to drain. Drain the skillet of all but 3 tablespoons of the bacon grease. Add diced potatoes to the skillet and cook for 3 minutes before stirring to allow potatoes to start to brown. Continue cooking the potatoes for 2 more minutes. Add the red bell pepper and cook for 5 minutes, until the veggies are tender. Stir in the corn kernels and cook for 3 more minutes. Pour vegetables into a large bowl and stir in the red onion slices, bacon, apple cider vinegar, and crushed red pepper. Add salt to taste and serve immediately. Original recipe found in Food & Wine Annual Cookbook, 2012.